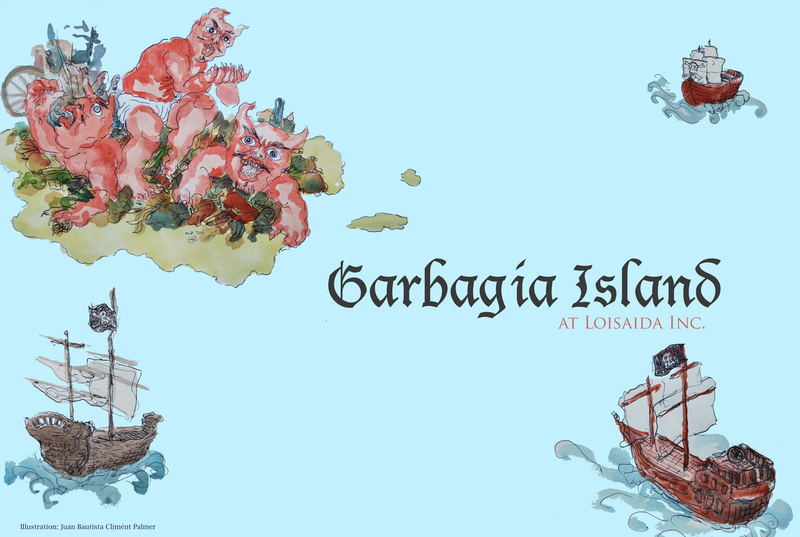 Garbagia Island | Loisaida Inc. The summer program will be developed in two weeks during July, creating an open platform for the community to participate in an integration and creative process. We will have open workshops five days a week, for the community and will have arranged visits from summer camps around the Lower East Side. They will all take place between Loisaida Inc.Center and La Plaza Cultural. During the workshops we want to educate the community about re-purposing waste into materials. They can be a tool for developing kids motor skills and adults perspectives and creativity. All the efforts will be directed into the final activity, it will take place at La Plaza Cultural. The activity will be compound of a fashion and creature show. We will have a live pirate band, a pirate host and a DJ. This activity will be a community celebration for the outcome of the workshops and will be open for the public. After the activity we will do a symbolic peregrination to Carmen Pabón re-opend garden as a showing of our support and admiration for Carmen Pabón’s legacy. We want to stand out community awareness of current legal garden’s risk and motivate people to take action in democratic process. The 2016 Summer Program was composed of a two-week intensive open workshop accessible to the general public. There were five distinctive workshops oriented toward various neighborhood summer camps and school groups. Screening projections and other audiovisual material was used for educational purposes to project the history and important people of the Loisaida (Lower East Side) Community. The final activity was open to the public and it culminated with a pirate fashion and creatures show highlighting the re-purposing of “trash” and the use of recyclable materials. See pictures below! July 30th, 2016 – 6:00 pm at La Plaza Cultural de Armando Pérez Community Garden. NEW YORK, NY, JULY 25 2016– Loisaida Inc. has produced a new summer program titled “Garbagia Island” which recasts the current fiscal crisis of Puerto Rico, and the new creative diaspora stemming from the Caribbean island with a direct lineage into the previous generations of immigrants’ foundational work of the Loisaida ethos. The outcome intends to present a forward-looking merger of eco-urbanism and art-based community making anchored on Loisaida’s history of place-keeping efforts and the re-generative spirit initiated by the community garden movement. The Garbagia concept is borrowed from long time LES resident and community artists, Rolando Politi, who is a main collaborator in the project. A pirate motif will also serve as fun story-line and metaphor for shifting outdated value-judgements of waste into hidden-treasure, conquistador into fellow-traveler, displacement into refuge-builder, fiscal crisis into sustainable opportunity. Organizations that have benefitted from the workshops and are involved in the initiative are East Village Community School, Corner Stone at Campos Plaza/ University Settlement, Lungs Working Students Program, Sixth Street Community Center After School Summer Young Program and NYU Urban Journalism Program. The culmination of this collaborative community project will be an Up-cycled Costume & Fashion pageant as well as pirate show that will take place at La Plaza Cultural on Saturday, July 30 at 6:00 pm. To learn more visit: http://loisaida.org/garbagia-island/. Loisaida’s First Summer Program was made in collaboration with La Plaza Cultural & the Museum of Urban Reclaimed Space and with your support, thank you.